You are here: Home › Sachin’s 100th century- Are Sachin’s Centuries Jinxed? Sachin’s 100th century- Are Sachin’s Centuries Jinxed? The cricket world saw one more milestone getting created- in the form of Sachin’s 100th century, which he scored against Bangladesh. Sachin scored his 99th century last year in a world cup match against South Africa, and since then people have been waiting for the 100th ton. But the fact that India lost this match led to yet another round of argument between the cricket fans- when Sachin scores a century India loses! Really? Is this how we should treat an achievement- 100th century- something no cricketer ever dreamt of? Yes, I am sad that India lost the match. But blaming Sachin’s century for that is too much. Logically speaking, how can one blame Sachin for the defeat when the bowlers didn’t perform well? And if the base of this statement is superstition, there should at least be some historically significant data to back up that belief. Most of the times when I see such status updates on Facebook, or listen to people talking about this, I go into an argument with them. But this time I decided to do it the Sachin way- let the numbers do all the talking. So, I spent some time yesterday digging out the data to prove that this superstition has no base to it. And here is the result. The stats below includes the match against Bangladesh, where Sachin scored his 100th century. Click on the graphs to enlarge. 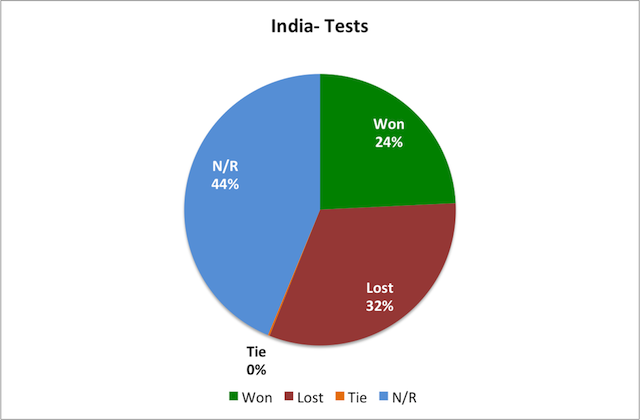 India won 39% of the matches in which Sachin scored a century- far greater than India’s 24% wins so far. Only 22% centuries were for a losing cause. India lost 31% of the matches in which Sachin didn’t score a century. 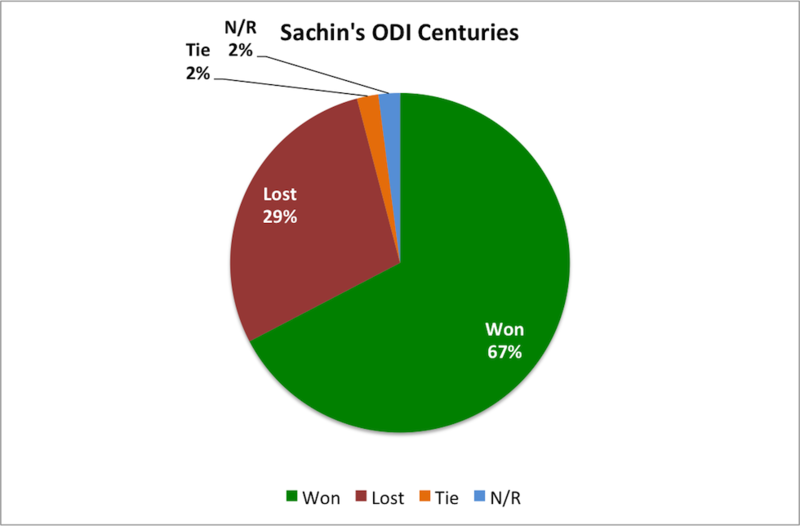 India won 67% of the matches in which Sachin scored a century. Compare that to India’s overall wins in ODIs- 49%! 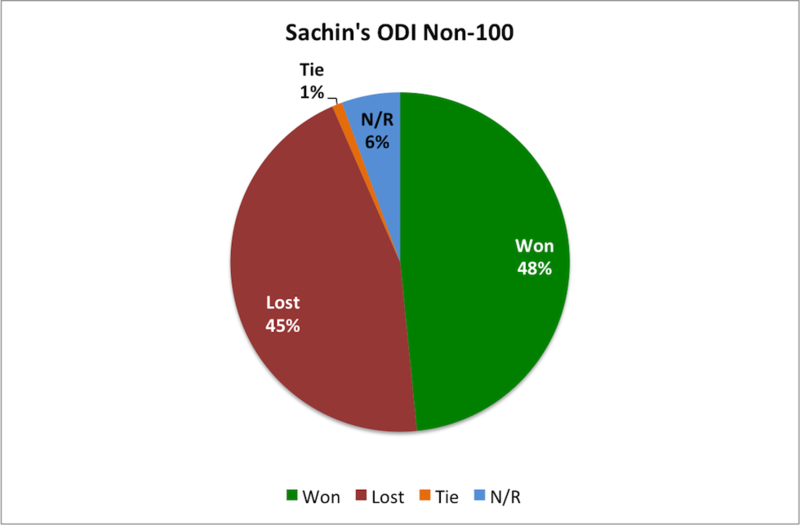 India won 48% of the matches and lost 45% of the matches in which Sachin didn’t score a century. When Sachin scores a century chances of India winning the match increases significantly. When Sachin doesn’t scores a century, chances of India winning the match goes down. So, next time when Sachin makes a century, rather than predicting that India would lose the match, you should be hopeful that India stands a lot better chance to win that match! Having said that, it is useless to derive any relationship between the centuries scored by an individual and the result of the match. This is like comparing apples to oranges. Cricket is a team game, and every one has to play their role properly to ensure a victory. With that I rest my case. Share it with your friends if you are a true Sachin fan. If you want a particular topic to be covered, please submit your request here, and we’ll make sure to write on it asap. Anshul Dixit is the founder of Knowledge Hub. Subscribe to Knowledge Hub to receive updates. Surprise! Surprise! Surprise! – Jane Eyre Still Has It In Her! 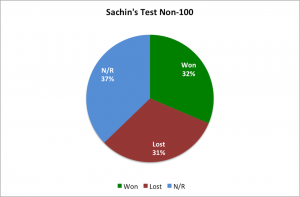 3 Responses to Sachin’s 100th century- Are Sachin’s Centuries Jinxed? We should consider pitch conditions and team against when evaulating a performance. 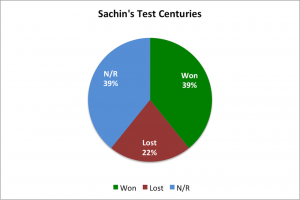 I guess Sachin has/had best record against Australia. That itself talks a lot about him. Sachin is not ball hammer like Dhoni, Raina who can score 100 in India but not 50 in Australia. In fact, I think Sachin has saved India’s face a lot many times. That being said, ODI has become run scorer lately and hence Sachin is more suited for Australian conditions and test conditions. Who need batting technique in ODI in Indian pitches? Anshul, I was Impressed with your blog and I am great fan of sachin tendulkar and always believed india has won many matches under him. But your statistics are wrong. You have considered all the matches India has played till date. Ideally you should have considered matches, after sachin started playing. That might give more clear picture.